Heat oven to 400°. Mix sour cream, cumin, beans, tomatoes, soup, chicken and chiles. Pour into ungreased square pan, 9x9x2 inches. Bake uncovered 15 minutes. Stir Bisquick mix, milk and cheese until soft dough forms. Drop dough by 12 spoonfuls onto hot chicken mixture. Bake uncovered 18 to 20 minutes or until biscuits are golden brown. 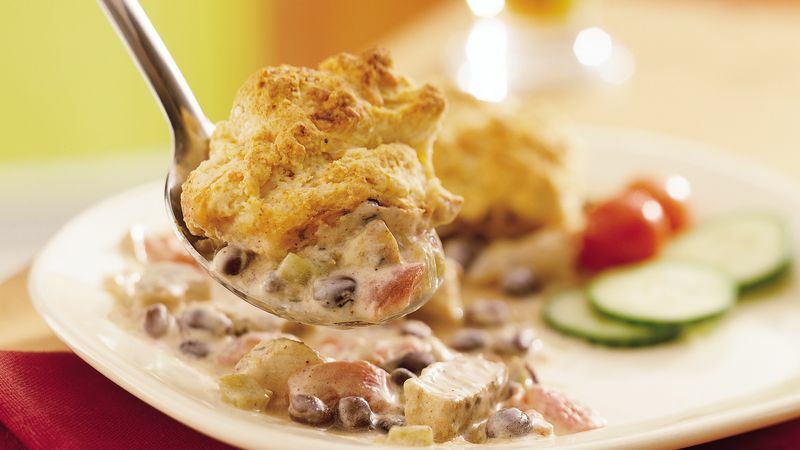 Pinto beans can be used in place of the black beans in this south-of-the-border main dish. Look for the chicken in the area where frozen meats are found in your store. Diced tomatoes with chilies come in a variety of heat levels. We've used mild here, but more adventurous palates can use medium or hot.